San Fernando Mission water system. On December 8, 1797, the San Fernando Mission was established in the Valley by the Spanish Padres. The San Fernando Mission completed a chain of missions that stretched from the San Diego Mission, founded in 1771, to San Buenaventura Mission, founded in 1782 and located in Ventura. Seeking good land, abundant water and Native Americans to serve as laborers, the missionary fathers chose a place in the upper half of the San Fernando Valley, formerly called Los Encinos Valley. “We found the place quite suitable for a mission,” Father De Santa Maria had reported, because it has much water” (Robinson, 3). The friars wanted to capture the available, abundant water and bring it to the San Fernando Mission. They followed a trickle of water from the foothills and found a large swamp (cienega) with several natural springs about a league (an hour walking distance) from the mission site. 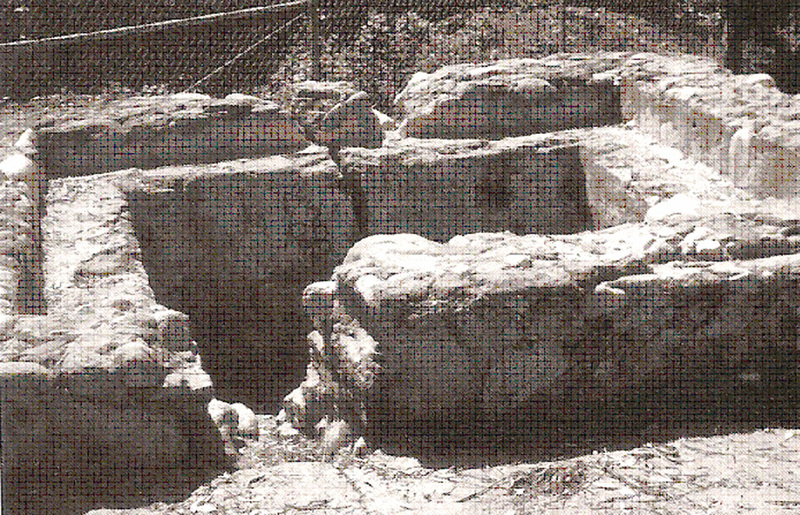 The friars began their aqueduct by building a settling basin, “the intake,” to catch water from the natural springs. The basin was made of mission masonry, which consisted of burnt-brick and rock mortared with concrete and then covered with limestone. “The square-like basin, whose inner dimensions are 11 feet square and 5 feet deep, is in excellent condition today, considering its age” (Pauley, 203). A catchment inside the basin filtered mud and other sediments before water entered the aqueducts. The water flowed by gravity to a masonry dam. Pipelines then carried the water over the dam to the mission. The dam constructed in 1808 across the Cienega Wash, located half a mile northeast of the mission site, created Cienega Lake. “Smaller pipelines and zanjas (ditches or trenches) led the water to the orchards, the olive groves, the two vineyards, and the cellar” (Pauley, 204). Pauley, Carol and Pauley, Kenneth. San Fernando Rey De Espana. Spokane, WA: The Arthur Clark Company, 2005. Robinson, W. W. The San Fernando Valley, A Calendar of Events. Los Angeles, CA: Title Insurance and Trust Company, 1951. The San Fernando Mission's old water system. The filtering basin "water intake" of Mission San Fernando's water supply system. 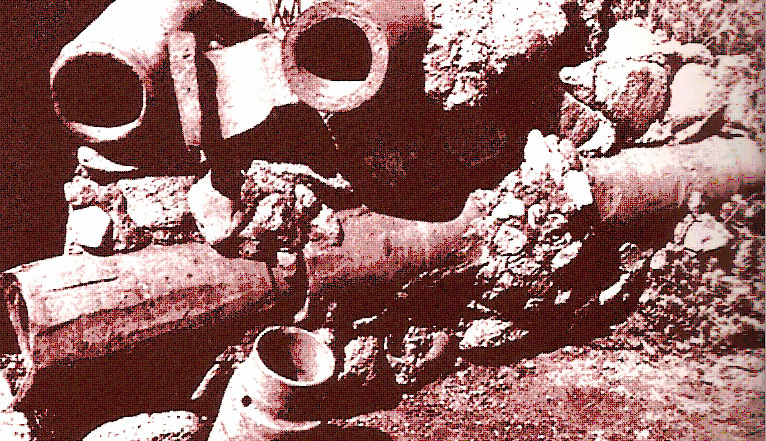 Sections of pipes that carried water from the wells to the mission. In 1914, a major flood covered the Valley ground. It caused $10 million in damages throughout the developing basin and brought attention to the possibility of recurrent flooding problems. The following year, the Los Angeles County Flood Control District was formed. Early flood control efforts included some channelization and support for reservoirs and dams. Taxpayers approved bond issues in 1917 and 1924 to build the initial major dams. However, taxpayers were not willing to provide enough funds for substantial infrastructure downstream of the dams. After two more destructive floods in the 1930s, Federal assistance was requested and the Army Corps of Engineers took a lead role in channelizing the River. Channelization began in 1938, and by 1960, the project was completed to form a fifty-one mile engineered waterway. Before channelization of the L.A. River, flood control projects and utilization of the River as a source of water changed the system of streams, wetlands, and swamps of the natural lands. Channelization provided flood control for the increasingly developed region and a consistent path for the River course. Today, the banks of the River are almost fully lined along its entire length. Only three portions of the channel bottom remain unpaved: most of the Sepulveda Flood Control Basin in the San Fernando Valley, portions near Griffith Park through Elysian Valley where ground water levels prevent it from being paved, and at the River estuary in Long Beach where the River empties into the Pacific Ocean. In 1940s, two major dams of the valley were built due to flood control, the Sepulveda Dam and the Hansen Dam. Both dams were built by the U.S. Army Corps of Engineers. The Hansen Dam is located near the northern edge of the San Fernando Valley on Tujunga Wash, about one mile below the Big Tujunga Wash and the Little Tujunga Wash. Hansen Dam, also known as Hansen Reservoir is earthen construction. Its height is 97 feet with a length of 10475 feet. Maximum discharge is 101000 cubic feet per second. Its capacity is 44990 acre feet. Normal storage is 1 acre feet. It drains an area of 152 square miles. In conjunction with Sepulveda Dam, it is vital for flood control protection of the lower portions of the San Fernando Valley and the City of Los Angeles. Sepulveda Dam is also of earthen construction, built a year after the completion of Hansen Dam in 1940. Its height is 57 feet with a length of 15440 feet. Maximum discharge is 99540 cubic feet per second. Its capacity is 27563 acre feet. Normal storage is 1 acre feet. It drains an area of 152 square miles. The purpose of the project is to collect flood runoff from the uncontrolled drainage areas upstream, store it temporarily, and release it to the Los Angeles River at a rate that does not exceed the downstream channel capacity. The project has eight outlet passages, of which, only four have gates. Because the other four passages have no gates, Sepulveda Dam cannot shut off flow to the Los Angeles River. It is located approximately 8 miles east of the river’s official starting point in the San Fernando Valley. Behind the dam, the Sepulveda Dam is home to several large recreation areas and parks, a model-aircraft field, Japanese gardens, a wildlife refuge, a water reclamation plant and an armory. In the San Fernando Valley, springs were the main source of water for irrigation and drinking until well after California was officially admitted to the union on September 9, 1850. In the 1880s, the Porter Land and Water Company was formed to help control the distribution of fresh water in the Valley as the region grew. In 1888, Pacoima’s founder sunk an innovative dam in the sand of Pacoima Wash, hoping to capture subterranean runoff. The situation was worse for the City of Los Angles. Having utilized much of the local groundwater supply and needing more water to support future growth, the City of Los Angeles purchased the Los Angeles City Water Company for $2 million in 1902, hoping to make tremendous changes to the city’s water system. With a population of more than 100,000, the City had doubled more than four times in 30 years and local water sources were scarce. The LA City Water Company’s Superintendent, William Mulholland, began to determine what the City’s actual needs would be. He estimated population growth based on the previous 10 years and foresaw a city of 390,000 people using more than 58 million gallons per day by 1925. Since the required volume more than doubled the flow of the Los Angeles River, Mulholland concluded Los Angeles would have to look elsewhere. Since 1892, Fred Eaton, Los Angeles former Mayor, had been investigating the Owens Valley, just north of Los Angeles. Owens Lake had become a basin from which there was no outlet. Once the water from the Sierras reached the lake, Eaton believed it was useless because it would get contaminated by the salt of the enclosed basin. Eaton had begun to plan for this water rather than see it wasted. In 1904 he was on the verge of acting on his plans and was aware that Mulholland was searching for a new source of supply for Los Angeles. When the idea was proposed to Mulholland, he was sure the Owens River was the source Los Angeles needed for the future. In March 1905, Fred Eaton had convinced the Owens Valley to sell their land to him with the intention to later tap its water source for the City of Los Angeles. Eaton then was able to buy land and water rights of the Owen Valley. He paid $450,000 for a two month option on ranch lands and 4,000 head of cattle, and acquired the rights to more than 50 miles of riparian land. Mulholland and Eaten then reported to be the Board of Water Commissioners that the Owens River was the only viable source of water to the City. Fred Eaton also told the City that they must acquire from him whatever rights and options he had been able to secure from the Owens Valley to further the project. Eaton’s dealings became the source of conflict between the Owens Valley and the City of Los Angeles. Eaton initially left an impression that he was there to do work for the Reclamation Service, but he was actually there to research and buy water rights for the City of Los Angeles. This impression caused anger among residents of the area when they discovered that Eaton was not acting on behalf of the Reclamation Service. To the people of the Owens Valley, selling water rights and land for a desired federal project was far different from selling land to Eaton and water rights to the City of Los Angeles. Mulholland estimated a 226-mile aqueduct would be built to bring water from Owens Valley to Los Angeles. In 1907 a $23 million bond was approved for the construction of the Los Angeles Aqueduct. 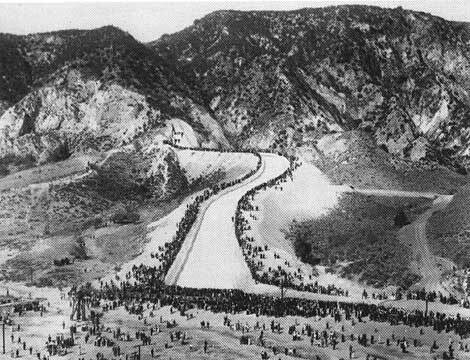 After six years of construction, the aqueduct was completed on November 05, 1913 with 30,000 people gathered at San Fernando Valley celebrating the cascading water. 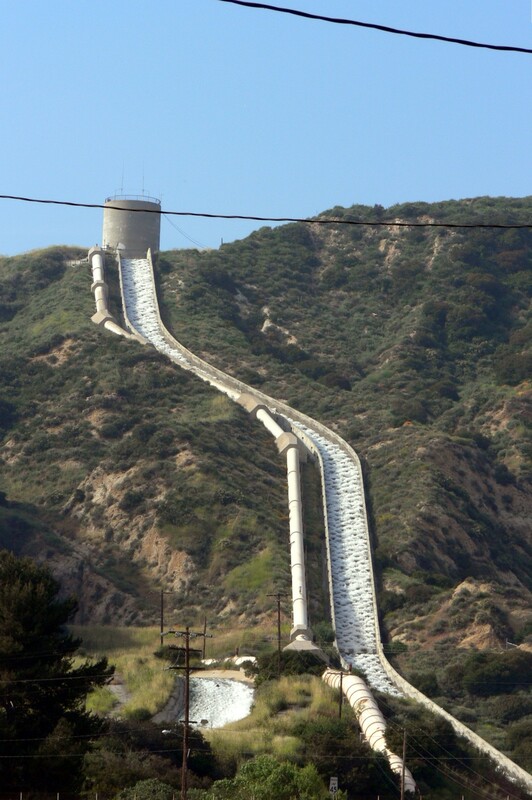 The Los Angeles Aqueduct, 226 miles long of conduits, tunnels, and ditches connected the Owens and San Fernando Valleys and provided 410 second feet of pure water, four times the amount Los Angeles supply at the time. 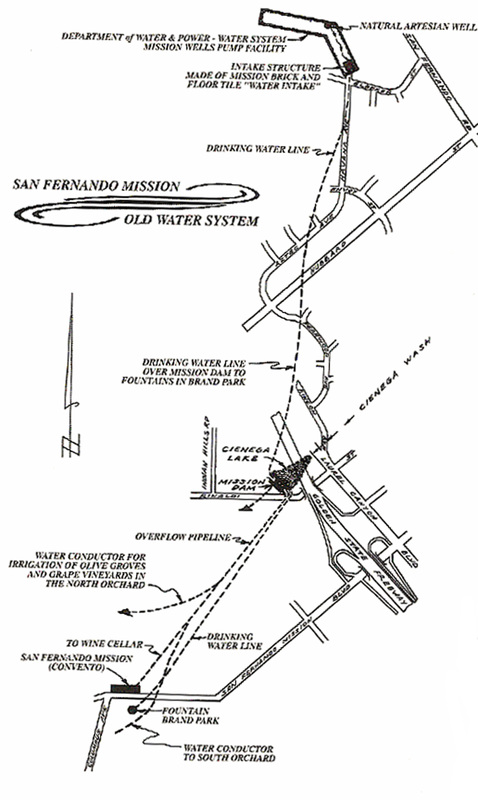 Although the new Los Angeles Aqueduct delivers abundant of water through the San Fernando Valley to City of Los Angeles, the Valley had no right towards that water. Private developers in the Valley knew that access the water from the Los Angeles Aqueduct would make the properties more valuable, so they worked with the local residents to vote to have their towns annexed to Los Angeles. Knowing that City of Los Angeles has the water rights, “most of the valley votes to join Los Angeles” (Roderick, 72), which led to the subdivision of Rancho Encino. The annexing began with Hansen Heights in 1918, Chatsworth annexed in 1920, and Lankershim annexed in 1923 (Roderick). Los Angeles Department of Water and Power. The Story of the Los Angeles Aqueduct. Roderick, Kevin. The San Fernando Valley, America’s Suburb. Los Angeles, CA: Los Angeles Times, 2001. The Los Angeles River is quite different from the typical image we get when thinking about a river. It is generally dry during the summer and fall and has heavy flows during the rainy and wet seasons. The floods of this river have killed more people in LA than from earthquakes. The daunting 100 year flood, a series of floods that extended from 1835 to 1938, ended with a particularly destructive year of flooding in the 30s that compelled the government to pave the LA River with concrete. This would help channel water quickly out of the valley to the Pacific Ocean to avoid heavy flooding from occurring during rainy seasons. As environmentalists feared, the water surging into the ocean escaped so fast that it backsplash into the river, thus destroying the rivers natural ecosystem. City officials and scientists quickly took action in slowing the river flow by ‘naturally’ greening the center with artificial islands of typical river vegetation. Aside from its actual purpose, the Los Angeles River is the longest park in the San Fernando Valley. The usable recreational area begins in North Hollywood which stretches to downtown LA. Although the river is not for swimming, there are bikeways, pedestrian paths, and horse trails on the riverbanks. There are several parks which sit along the river which pedestrians can access from the river bank paths. Further south toward Atwater, the riverbank has its own little yoga and stretching park. Even recently, in 2005, the Ad Hoc River Committee proposed a 20 year plan to revitalize the river, and would get funding from Los Angeles Department of Water and Power, the City of Los Angeles’ Department of Public Works-Bureau of Engineering. This was called Revitalization Master Plan which would attempt to make the Los Angeles River a “front door” to the City, and support a multitude of civic activities. The proposal within 18 months quickly assured the health of the river, along with protecting wildlife. Today, a group called “Friends of the Los Angeles River” (FoLAR) has been backing this proposal, promoting the creation of a wildlife passage from the mountains to the ocean.